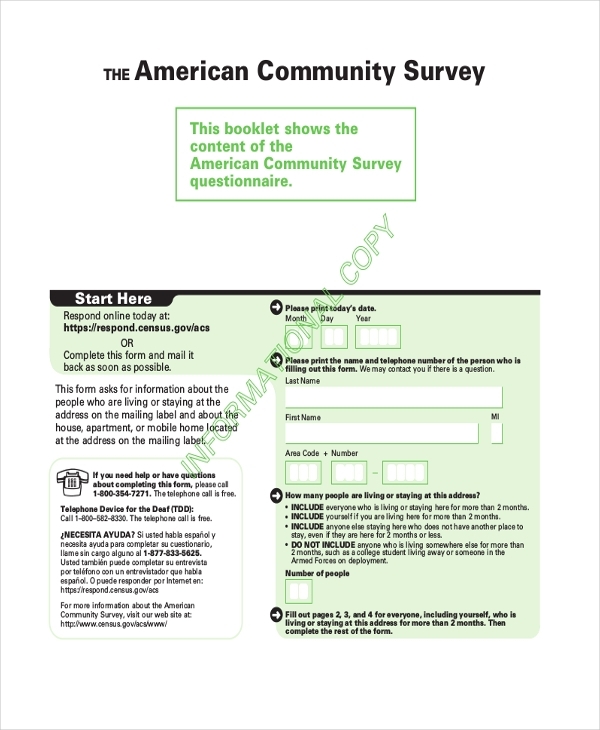 The survey forms are really handy when you have to gather information or public opinion on something. 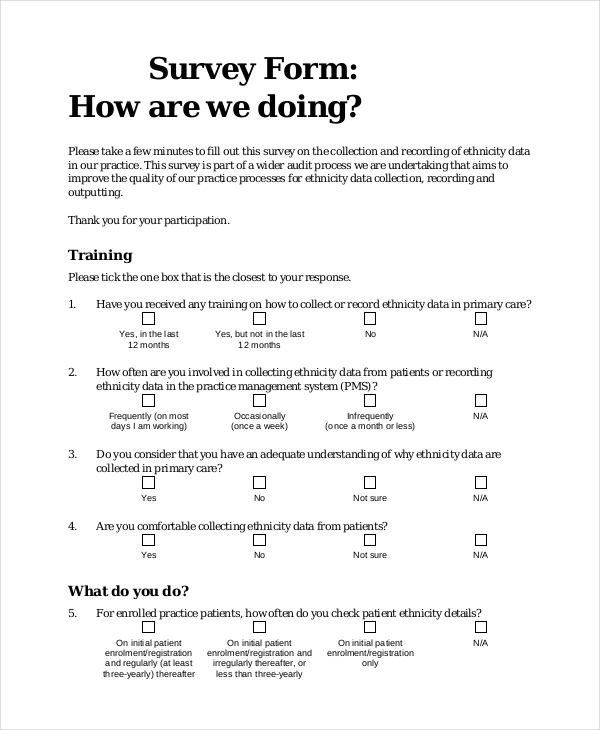 These forms are used for a versatile range of purposes to gather feedback on training workshops, to assess the general health of a community, to have a hang of customer satisfaction regarding your company and so on. These days surveys are mostly conducted online which is a cost-effective solution and also saves both time and money for the surveyor. 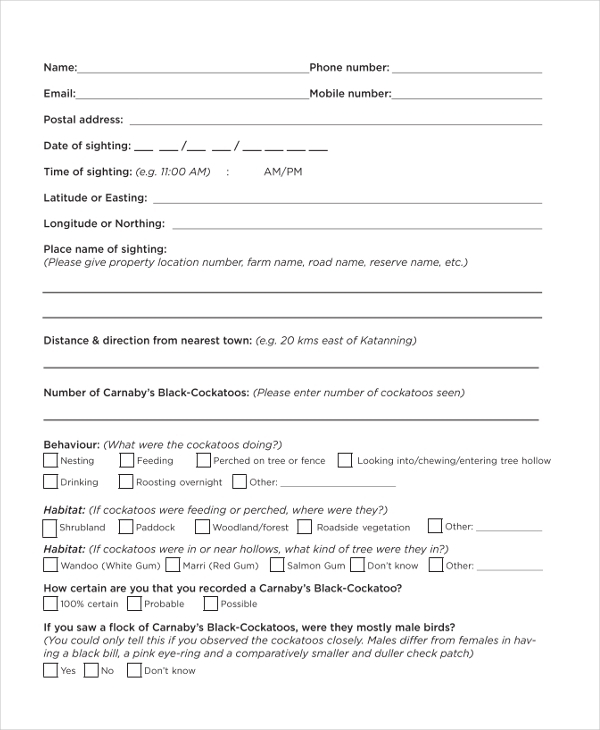 If you want survey forms that can record the sightings of an animal or a bird, this form here would be useful as it comes with all important sections to document major details regarding the sighting. You have a detailed BMP compliance survey form template here that begins with all details of survey preparation, followed by a record of survey, PCS information, inventory verification, space for citing storage areas etc. 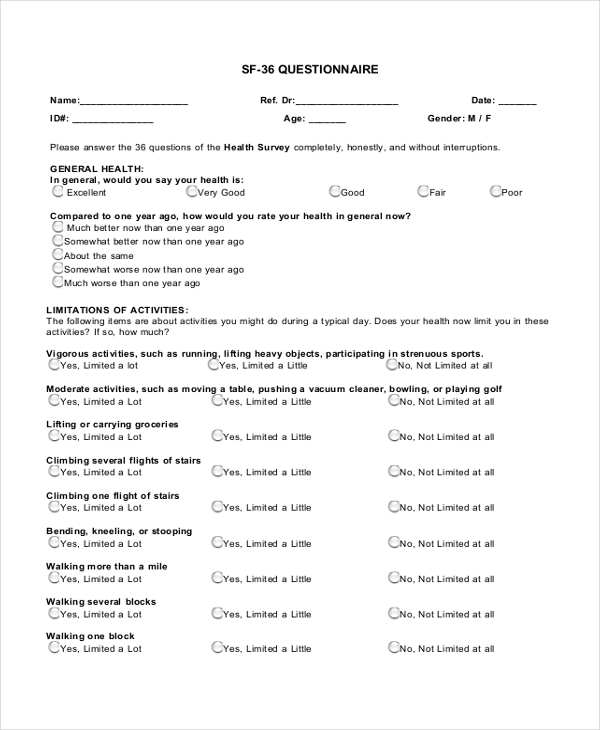 If you are on the lookout of a standard health survey forms, this form here would be really useful with its questions on general health, activities performed by the individual, health issues etc. 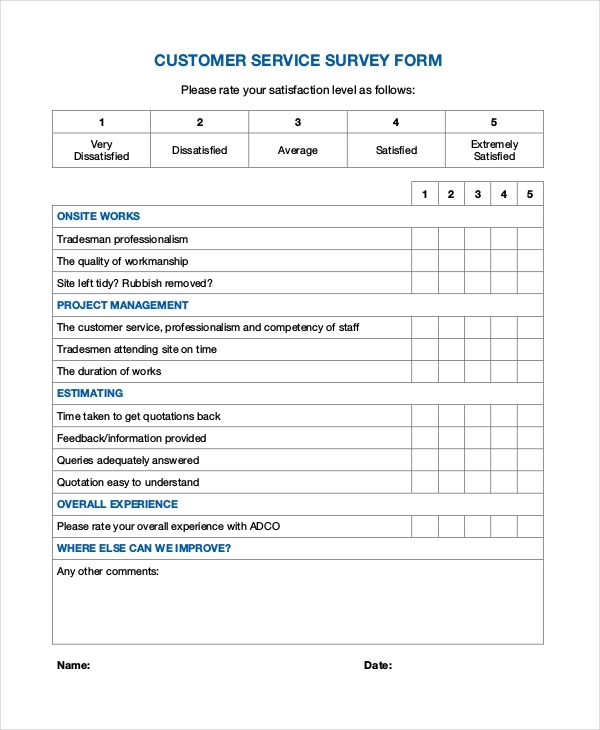 You have an elaborate customer survey form here that begins with a grading scale based on which the customer would mark his experience regarding the different services provided by your company. You have a smart and edgy customer satisfaction survey form here which features on every aspect of your company’s service and customer care -and below you have checkboxes where the customer would place his opinion. When you need the consent of the possible respondents regarding their participation in your survey, this form offers you the right template to gather their consent. It also states that the respondent’s identity information would be kept confidential. If you are looking forward to gaining insights on how your staff is performing as a part of your company, you have the best form here that will help them to mention their activities on every aspect of their job. 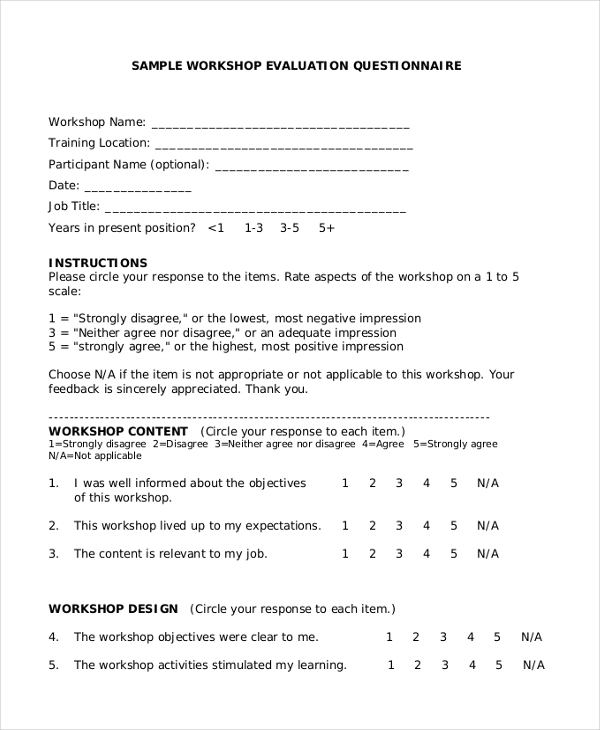 If you are looking to gain feedback from the participants of your workshop regarding how they felt being in your workshop, you should not look beyond this survey feedback template. This community survey form will enable you to gather information about as many as 12 persons, regarding different aspects of housing like the rent, mortgage, house maintenance, utility bills, tax etc. 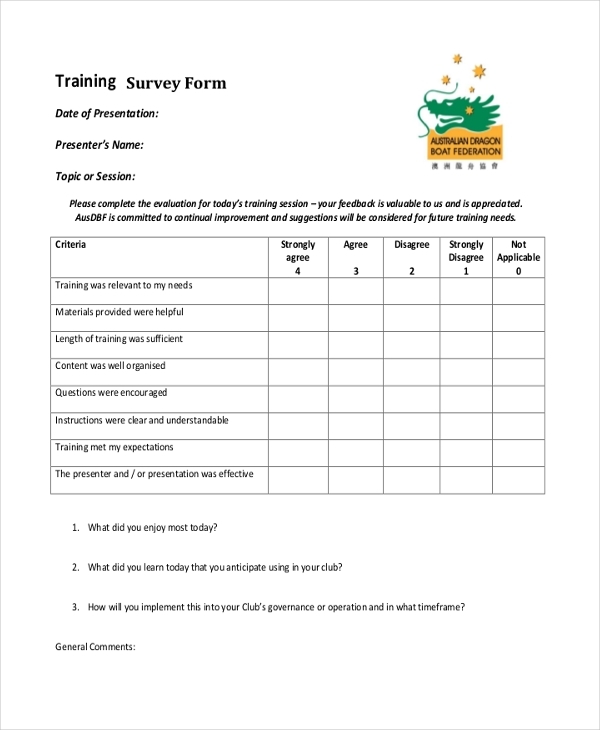 You have a concise training evaluation form here that would be helpful to gather information from your trainees on what they have felt regarding various aspects of your training program. 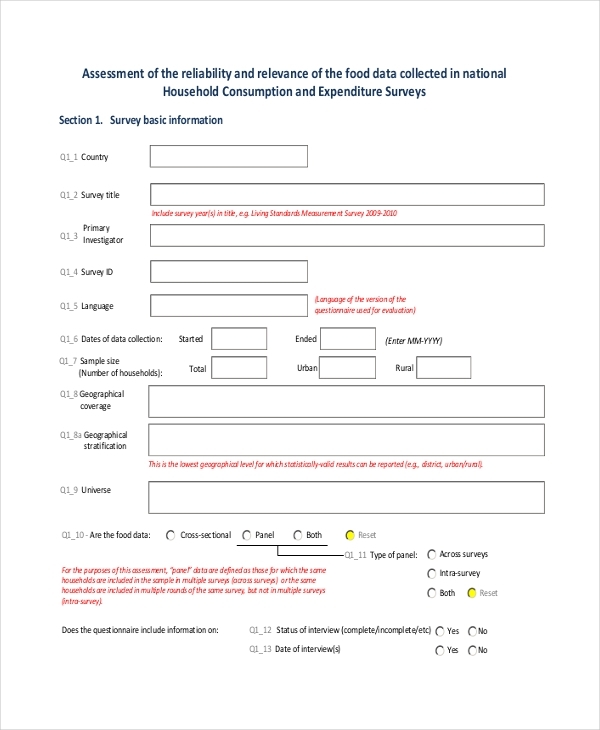 This food survey form will enable you to collect all the details regarding the conduction of the survey which would be handy while you are assessing the survey and its scope. 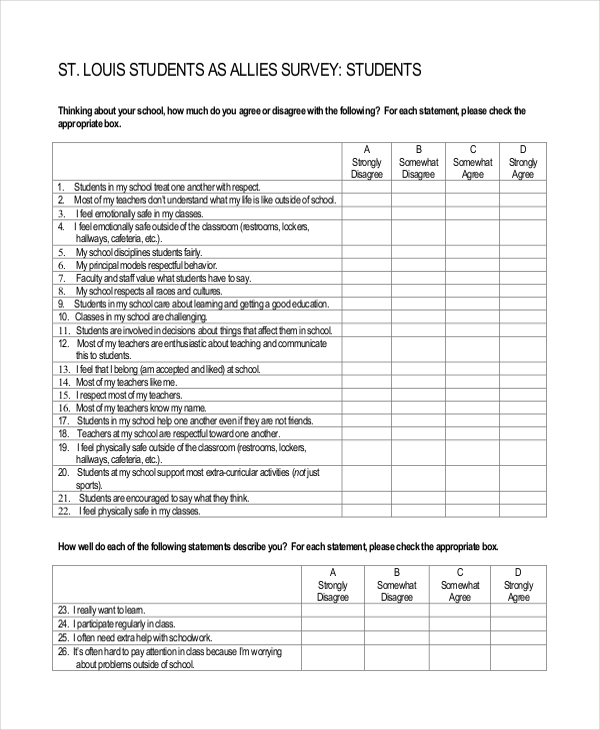 This student survey form begins with tips from student researchers to help the fellow researchers and you have a long list of questions here with questions and grading codes adjacent to each question. You have an elaborate market survey form here that starts with identification particulars, followed by staff details and survey time, data on consumer goods, key commodities traded and market performance barriers. 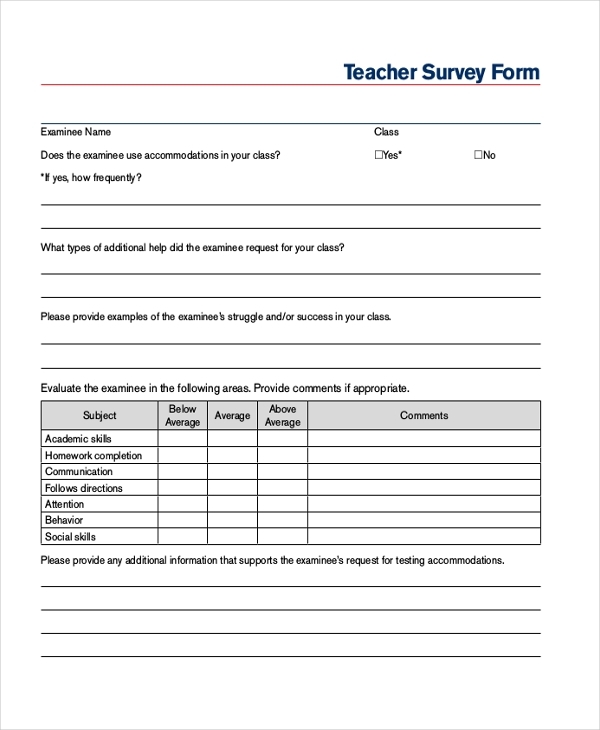 This survey form is to be filled by teachers when you want to evaluate the stance of examines in the classroom under the teacher’s vigilance. There is legible spacing for detailed answers. What is The Benefit of Survey Forms? The survey forms are really useful when you are planning to conduct a study on something or wish to gather feedback or opinion on a certain subject. At times your individual opinion might not be sufficient to establish a point or understand a particular circumstance. In such situation, you would need insights from a large number of people which will enable you to come up with an informed inference. It should be stressed that surveys are the best way to gather information from targeted audience. What are Tips to Follow With Survey Forms? First of all, you must decide beforehand the various parameters of your research as your questions would be based on that only. Make sure the questions you form help you to assess the condition you wish to study in the most comprehensive manner. If you want your respondents to put their grades, it’s better you specify a number-coded grading scale on top of the survey forms. Don’t offer too many or too few options and please do not include double-barrel questions. 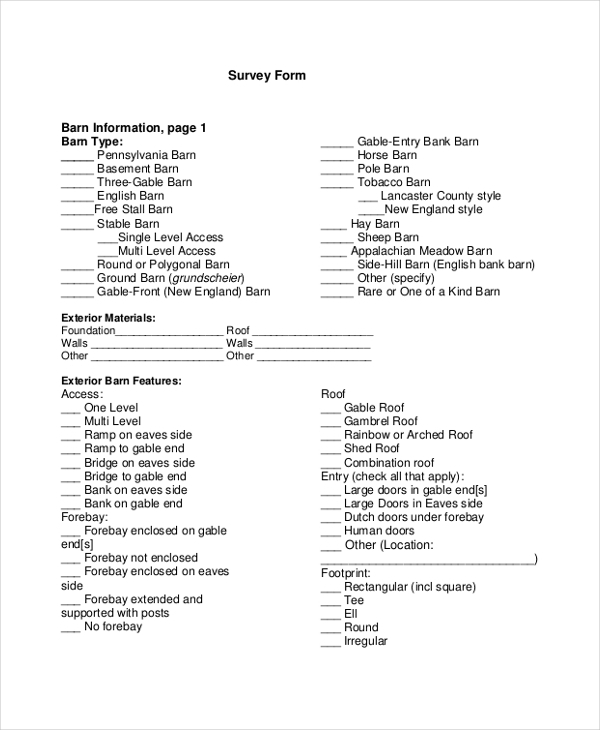 If you are looking for tips on how to format survey forms, the templates mentioned here would be a great aide for you. You have a wide range of survey forms here which can be used for different surveys. You can choose the one that suits you, download it and then customize it with your own set of questions.